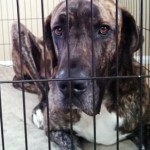 Meet Ryder - Rocky Mountain Great Dane Rescue, Inc.
Hey there, I’m Ryder! I’m a 2 year old brindle Dane/St. Bernard mix with natural ears. I’m good with other dogs and have been living with a dachshund. I’m also good with kids and have been living with an 8 year old and a 12 year old. I haven’t spent any time around cats, but I’m sure with slow introductions I could be okay with them too! I know all of my basic commands and am housebroken. I’m also crate trained and trustworthy with free roam. I love going for walks and do well on a leash with my gentle leader. I also like to chase bunnies – just a little something to keep that in mind when we go for walks. Oh, and I also really like my food, so it’s best if no one comes near me while I’m eating – I’m not a very good sharer when it comes to that. I think that covers all the big things, so let’s get together to see if you could be my forever family! I am being fostered in Nebraska.